Skerry’s photography is often seen in the pages of National Geographic Magazine. He balances the wonder of the living seas with thoughtful warnings about global threats including overfishing, climate change and pollution. 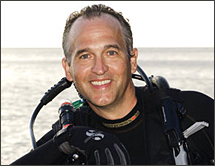 He shares the wonder and warnings in his many public talks, through his photographs and in his visually stunning new book Ocean Soul in which he explains, "I have been blessed to realize my dream of becoming an underwater photojournalist, but with that I feel an obligation and sense of urgency to share what I have seen with others."